New York, London, Sydney, July 13, 2017 – Vela, an award-winning global leader in high performance trading, market data, and analytics technology, has signed a definitive agreement to acquire Object Trading, a global provider of a fully-managed Direct Market Access (DMA) platform, pre-trade risk controls, and analytics applications. This acquisition further strengthens Vela’s high-performance trading and market data technology products and services, delivering an extensive set of solutions across the entire electronic trading workflow to help clients reduce total cost of ownership, comply with ever-changing regulatory requirements, and evolve their global electronic trading strategies. 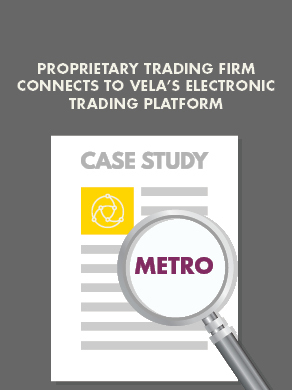 The addition of Object Trading and OptionsCity enables Vela to provide an end-to-end trading platform with global, multi-asset class coverage; high-performance, low-latency market access and market data; industry leading pre-trade risk controls; drop copy functionality; post-trade processing; trading analytics; plus, a front-end GUI for price discovery, workflow management, and order entry. The Object Trading transaction is subject to regulatory approval and customary closing conditions. It is expected to close in early Q3 2017. Willkie Farr & Gallagher LLP served as Vela’s legal advisors in the transaction. Goldenhill International M&A Advisors served as Object Trading’s strategic advisors; and PwC acted as Object Trading’s legal and financial advisors. The OptionsCity transaction, which was announced on June 20, 2017, has closed. Object Trading delivers an independent, global, multi-asset direct market access trading infrastructure combined with decades of client-side insight and experience, enabling each customer regardless of its trading strategy, size, style or frequency, to innovate, control risk and trade in an ever-changing and fiercely competitive environment. Object Trading’s DMA Platform provides ready access to the international markets with a proven, independent infrastructure that readily normalizes the mass of market connectivity, eliminates infrastructure startup processes and unifies risk constraints, ultimately enabling accelerated growth. Object Trading is connected to more than 60 global equity, derivative and FX exchanges for both market data and order routing, with offices in London, New York, Chicago and Sydney.